"Dizzy, or Dizzy - The Ultimate Cartoon Adventure, was the first video game featuring the character Dizzy, an anthropomorphic egg. The game was designed by two British brothers, Philip and Andrew Oliver, frequently referred to as the Oliver twins. 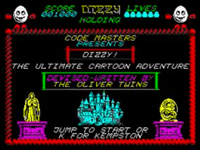 Dizzy gets his name from the character's tumbles and somersaults while jumping, a feature inspired by the Oliver Twins' graphics software Panda Sprites which enabled them to rotate an image easily so each frame did not have to be manually drawn. The software distorted complex sprites so the character was required to be simple, hence the choice of an egg. The game is a platform adventure where Dizzy must search the fairy tale land of Katmandu for a Leprechaun's Wig, a Cloud's Silver Lining, a Vampire Dux Feather, and a Troll Brew and deposit them in a cauldron to make a potion to defeat the evil wizard Zaks. The gameplay involves collecting items and moving to other locations where the item is required; for example, at one point a raincoat is needed to protect against damaging rain. This is made more difficult because only one item can be carried at any given time. Unlike later games in the series, which focus more on the inventory-based puzzles, this game features a very large number of hazards that impede the player's progress." Source: Wikipedia, "Dizzy_-_The_Ultimate_Cartoon_Adventure," available under the CC-BY-SA License.